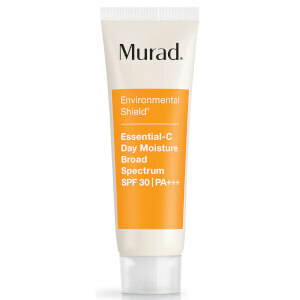 Treat, blur and protect with Murad Invisiblur Perfecting Shield SPF30, a multi-tasking formula that works to prime the skin, improve signs of aging and protect from sun exposure. Invisible on application, the formula combines mushroom peptides with a soft focus complex to diminish the appearance of fine lines and wrinkles, and blur imperfections. The ultimate in anti-aging technology, the broad spectrum moisturizing blend will leave you with irresistibly soft, youthful looking skin. Free from parabens, sulphates, phthalates, gluten and animal derived ingredients. Massage evenly over face, neck, and chest. May be applied under makeup or worn alone. Isododecane, Dimethicone/Bis-Isobutyl PPG-20 Crosspolymer, Caprylyl Methicone, Caprylic/Capric Triglyceride, Phenyl Trimethicone, Homosalate, Ethylhexyl Salicylate, Butyl Methoxydibenzoylmethane, Octocrylene, Diethylhexyl 2, 6- Naphthalate, Propylene Glycol Dicaprate, Hydrogenated Soybean Oil, Hydrogenated Soybean Polyglycerides, C15-23 Alkane, Helianthus Annuus (Sunflower) Seed Cake, Ribes Nigrum (Black Currant) Seed Extract, Octyldodecanol, Octyldodecyl Oleate, PEG -8 Dimethicone, Octyldodecyl Stearoyl Stearate, Alcohol, Hordeum Vulgare (Barley) Extract*, Butylene Glycol, Lentinus Edodes (Shiitake Mushroom) Extract, Mucor Miehei Extract, Paeonia Suffruticosa Root Extract, Ascorbic Acid, Tocopheryl Acetate, Retinyl Palmitate, Silica, Sodium Propoxyhydroxypropyl Thiosulfate Silica, Cucumis Sativus (Cucumber) Fruit Extract, Rosmarinus Officinalis (Rosemary) Leaf Extract, Solidago Virgaurea (Goldenrod) Extract, Benzyl Benzoate, Citral,Hexyl Cinnamal, Hydroxyisohexyl 3-Cyclohexene Carboxaldhyde, Limonene, Linalool, Fragrance.